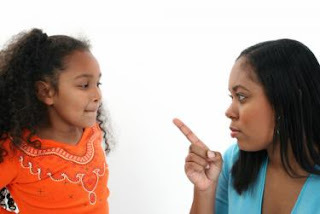 Have you got a stubborn child that doesn’t like to be told what to do? It seems the smallest request can quickly turn into a show down of wills. Who needs defiance or a melt down just as your heading out the door in the morning or trying to get supper on the table? Here are a few great lines that can help get a more positive response and win the co-operation of even the most obstinate child. Strong will children object to being told what to do or to following orders. Instead of telling your child what they should do, try asking them what needs to happen. Instead of : Hang up your coat. Try: Where do coats go? Often we threaten our children in order to get them to jump into action. Of course the strong willed child will just refuse and dig their heels in further. Instead, try a few changes to your wording that will turn threat into a simple statement of how the routines happen in your house. “WHEN the play room is cleaned up, THEN I’ll know you are ready for supper.” It sounds almost the same, but the meaning is very different. The routines are now the boss, dictating what should happen, not a parent’s personal power over the child. In fact, said this way, the power is held by the child to decide for themselves, which is critically important to strong willed children. Sharing power with the strong willed child is crucial. You can share power by giving choices. When a person has choice, they hold the power that comes with being the decision maker. Would you like to turn off the TV or shall I? Would you like hop to the bathroom like a bunny to brush your teeth or slink like a fox? Would you like to read Hansel and Gretel or The Three Little Pigs tonight? It’s so easy to lock horns with the headstrong child. Too often we end up in counter productive arguments that has everyone defending their position in an endless fight of “point – counter point”. Instead, try something different when you hear your child make a rebuttal. Listen to them intensely instead of defending your own position. Child: I don’t want to wear my coat. Mom: It's only 40 degrees! You’ll catch a cold. By listening, mom is reflecting back to the child that she does appreciate the child’s power, feelings their personal position on the matter. When a child feels understood and empowered, they don’t have the need to push back and oppose you. You are proving by listening that you are more an ally than the enemy to oppose. You are “taking your wind out of their sail” as eminent child psychologist Dr Rudolf Driekurs would say. Your child is more likely to act constructively and cooperatively… over time! Your self-determined child does not like to feel that you are pushing your personal agenda on them. Instead of you announcing “It's time go home” or “it's time for bed”, which is almost always followed by the real or unspoken “because I said so!” and makes you the meanie to your child’s mind, instead, set a timer to ring to announce the time and share your disappointment! Now, you and your child are on the same team, both upset with the time! Be sure to follow through with leaving. What tactics work best for you and your child? Does Plastic Surgery Really Make You Look Younger?